Registration is now open for the National Fatherhood Summit hosted by The U.S. Department of Health and Human Services’ (HHS), Administration for Children and Families (ACF), and the Office of Family Assistance (OFA). 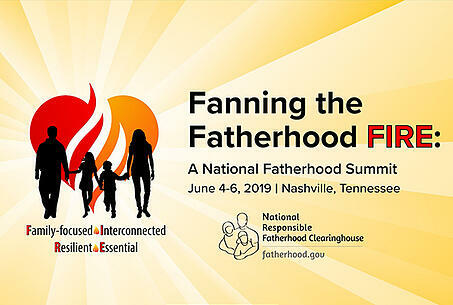 Join your fellow fatherhood practitioners in Music City, USA at the Gaylord Opryland Hotel in Nashville, Tennessee, June 4-6, 2019, where practitioners from across the country will be “Fanning the Fatherhood FIRE” at an inaugural summit designed to support and expand fatherhood efforts across the country. The summit theme is “Heart on FIRE” designed to convey the passion, warmth, and vision they hope to inspire in all participants. Be sure to secure your free registration as soon as possible, as space is limited. Family-focused – Fathers are integral to the family and family systems. Interconnected – Fathers’ connection to service providers and their community partners and fathers’ connection to the workforce, their communities, and society are crucial. Resilient – Despite difficulties some fathers face—whether as a single dad, or a dad returning to their families and communities after incarceration—healthy, engaged fathers demonstrate the capacity to recover quickly and overcome all obstacles. Essential – Fathers are essential and irreplaceable. Fathers’ essential role is multi-faceted and includes the social, emotional, and financial well-being of their children and families, and their essential position as role models and leaders in the eyes of their communities and society. The summit’s programming features a cadre of compelling and thought-provoking presenters, interactive learning opportunities, meaningful conversations, and plenty of networking opportunities for you to meet and share ideas with your peers. The summit is intended for a broad audience, including practitioners currently or interested in serving fathers, current OFA Responsible Fatherhood grantees, federal, state, and local governments, community leaders, social service agency representatives, health and human service professionals, institutions of higher learning, researchers, philanthropies, and other stakeholders interested in exploring ways to support and promote responsible fatherhood. And, of course, fathers and mothers are welcome! Don’t delay, register here today!